While the fluid is at operating temperature, completely drain the system, paying attention to the reservoir, all lines, cylinders, accumulators, filter housings or any area of fluid accumulation. Also, replace the filters. With a lint-free rag, clean the reservoir of all sludge and deposits. Make sure the entire reservoir is free of any soft or loosened paint. Flush the system with a lower viscosity fluid that is similar to the fluid to be used. A Reynolds number between 2.000 and 4.000 should be selected to achieve enough turbulence to remove particles from the lines. Stroke valves frequently to ensure they are thoroughly flushed. The fluid should be filtered and the flushing should continue until reaching one level beyond the system’s target cleanliness levels. For example, if the target is ISO 15/13/11, continue to flush the system until ISO 14/12/10 is reached. Drain the flushing fluid as hot and as quickly as possible. Replace the filters and inspect/clean the reservoir again. Fill the system to approximately 75 percent with the fluid to be used. Bleed/vent the pump. If the pump has a pressure relief or bypass, it should be wide open. Run the pump for 15 seconds, then stop and let it sit for 45 seconds. Repeat this procedure a few times to prime the pump. Run the pump for a minute with the bypass or pressure relief open. Stop the pump and let it sit for a minute. Close the bypass and permit the pump to operate loaded for no more than five minutes. Allow the relief valve to lift to confirm that it is flushed as well. Do not operate the actuators at this time. Stop the pump and let the system sit for about five minutes. Start the pump and operate the actuators one at a time, allowing fluid to return to the reservoir before moving to the next actuator. After operating the final actuator, shut down the system. Keep an eye on the fluid level in the reservoir. If the level drops below 25 percent, add fluid and fill to 50 percent. Refill the reservoir to 75 percent and run the system in five-minute intervals. At each shutdown, bleed the air from the system. Pay close attention to the system sounds to determine if the pump is cavitating. Run the system for 30 minutes to bring it to normal operating temperature. Shut down the system and replace the filters. Inspect the reservoir for obvious signs of cross-contamination. If any indication of cross-contamination is present, drain and flush the system again. After six hours of operation, shut down the system, replace the filters and sample and test the fluid. The sampling frequency should be increased until you are confident that the system fluid is stable. Some adherent machine deposits require tactics that are more aggressive than a high-velocity flush, so you must match the flushing tactic and strategy to the problem you are trying to resolve with the flush. Once you understand the problem within the machine that needs to be cleaned, you can then select the appropriate flushing tactic to remedy it. At this point, it should be obvious that a fluid changeout is not just a drain-and-fill operation. Care must be taken to confirm that the system is as clean as possible prior to introducing the new fluid. Most changeover procedures suggest that some of the old fluid will need to be either drained off the bottom or skimmed off the top of the reservoir after a period of time. Just because the changeover has been completed does not mean that you are “out of the woods.” Your system will need to be closely monitored for a while to make certain that the flushing was thorough. Taking the time to verify that the system is fully flushed and purged of the old fluid prior to introducing the new fluid will go a long way toward ensuring a healthier hydraulic system. 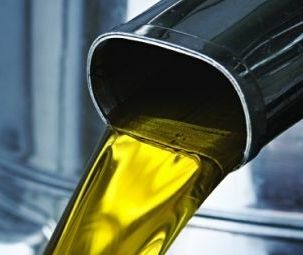 Lubrita Hydraulic Fluids, Lubricants and Technical Dada sheets You can find here: http://www.lubrita.com/product/hydraulic_oils_lubricants or contact direclty our technical department. typically caustics and acids, used to aid in the removal of organic sludge and oxide deposits. Mechanical Cleaning — This involves the use of scrapers, brushes and abrasives, typically used with solvents and other chemicals, to remove hard adherent surface deposits. Odden, Tom. (2001). “Cleaning and Flushing Basics for Hydraulic Systems and Similar Machines.” Machinery Lubrication. Ruble, Lyle. (2006). “A Guide to Converting Hydraulic Systems from Mineral Oil to Synthetic Hydraulic Fluid.” MRL Hydraulics. Loren Green is a technical consultant with Noria Corporation, focusing on machinery lubrication and maintenance in support of Noria’s Lubrication Program Development (LPD). He is a mechanical engineer who holds a Machine Lubrication Technician (MLT) Level I certification and a Machine Lubricant Analyst (MLA) Level I certification through the International Council for Machinery Lubrication (ICML).